First of ll, I would like to express my million thanks to HOPE Church, especially to Pastor Denis Lu and Pastor Laurence for helping in conducting the wedding matrimony. In addition,many thanks to all my brothers and sisters in church who helped voluntarily in the church (too many of them,unable to list them all here :) ). This is the flyer used in the wedding Matrimony ! Backdrop used in the wedding matrimony !! There were more photos/videos coming out in a while, from the morning until the dinner that night. Some funny videos available too once I've arrange it properly. 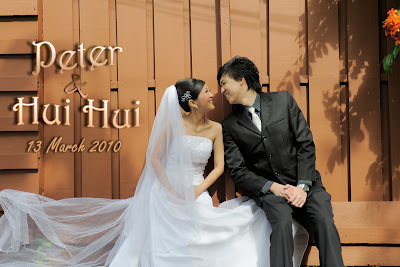 Overall, by God's grace the wedding ran smoothly with the help from different one. Once again thanks to all of you who have contributed to my wedding either directly or indirectly. Beautiful shots right there, they are such a beautiful romantic couple. One thing for sure! I love the photos. I would love to see more photos, looking forward of it. Thanks you.